Last edited by DDonovan; 07-30-2012 at 11:33 AM. The registration form is complete and is being hosted with Importmeet.com. They are sponsors of the event and have agreed to host the registration form. Importmeet.com has nothing to do with hosting the event itself or are they part of the organization team, they are just helping out the import meet community by offering me a space to host the registration form,although they will be attending the event this year. Big thanks to Matt at Importmeet.com for all his help. One of the NSX crew that lives up in Courtney has offered his 5 acres of grassy land up to anyone that wished to bring a tent. Most of us stay up on the Mountain on the Saturday night. We do get a deal on the rooms, last year it was between $89.99 and $119.00 depending on the room type. Paris from NSXPrime lives at the bottom of the mountain and as such this is a perfect way to save some cash. I realize that with a ferry and the event costs that can get expensive, so Paris has offered up his property to anyone that wants to tent it to try and save some money. He also said anyone that wants to bring up a trailer or something like that is welcome to as well. Just thought I would pass that on..., and a big thanks to Paris from NSXPrime. Contact me and I will put you in touch with Paris. Last edited by DDonovan; 04-23-2012 at 10:41 AM. Sponsorship is still coming in. Registration is going well. Last edited by DDonovan; 05-22-2012 at 03:05 PM. Friday August 17th - Meet at the Poker Run Starting location (4000 Seymour Place) around 7:30pm. We will get together and I can hand out the maps and paper work to those that are here on the island already. After that perhaps a small cruise and we have been invited down to the Swiftsure Lounge afterwards, which is right in the inner harbour. We can have some appies and drinks. Saturday August 18th - Arrive at the starting location for 9:00, Please don't be any later so I can get any paperwork off and we can have any announcements that need to happen. I want to send out the first crew no later than 9:30 and the second crew about 15 minutes later, again depending on how many participants we have by then. The event will last all day with a dinner and awards evening. We have the chalet until midnight so you are welcome to sit with us or you can go out and enjoy the Mountain. Dinner is normally around 7:00pm and is always excellent fair. Sunday August 19th - Gather at chalet for 11:00. Last year one group continued on up island to Gold River, while the others headed back on a slow cruise back to Victoria stopping at one of the checkpoints for lunch. If you are coming over from the mainland you can indeed make it back on the Saturday night. The Nanaimo last ferry leaves at 10:45 giving you time for dinner without a problem. Last edited by DDonovan; 06-04-2012 at 10:05 AM. The menu is set. I have been working with the caterers up at Mt Washington resort to come up with a menu for the Poker Run and I think we have something that everyone is going to love. I also want to re-iterate that this event started out as a Honda/Acura event. Last year we invited out all Japanese Imports, this year the event is open to any car enthusiasts out there, exotics, European Imports, and tuner cars. You don't have to have a super modified car either. There will be some cars there that are completely stock. Also if you can't attend but would like to donate in any way, please contact me. Lastly if you can't make the Poker Run but can come up for dinner with us, you can do that as well. The price would be $50.00 per person which includes a $22.00 donation to the charity. Thanks to those that have registered for the event! I can't do this without you. Last edited by DDonovan; 06-18-2012 at 04:04 PM. Registrations continue to trickle in, thanks to everyone that has registered, and to those that have already paid. We need to have 60 people attend the event to break even on the dinners. To get the deal that we do on dinners we have to commit to 60 people and we have hit that this week, assuming everyone on the list below attends. We just hit 34 cars which is great two months out. I am hoping to hit 40 cars this year but 50 would be very nice. I am continuing to receive raffle items and adding to our sponsorship list. Closer to the date I will post up all of the raffle items that we have received so you have a good idea what will be offered. I have started to compile the maps for this year as well. There are a few changes but all positive ones. Again I am making every effort to stay off the highways where we can, so we can enjoy the coast and it's abundance of twisties. Being as we have added two new CheckPoints, obviously there will be changes. It is challenging coming up with the map routes and keeping in mind the time it takes to do the route..., I can only say it will be BETTER than last year (as hard as that was to beat). Please if anyone knows of anyone that might be interested in taking part in the event, or in helping out with some sponsorship, either get them in contact with me or you contact me and I will contact them. The event again is open to all Sports, Exotics, Tuner, and Import vehicles this year, either stock or not. For those that might be interested in sponsorship, we are looking for nice items to raffle off, some freebie stuff for participation gifts, or, of course, cash donations. I can offer a tax receipt for any cash donations if you request one. Sponsors are also welcome to put in a car as a participant. 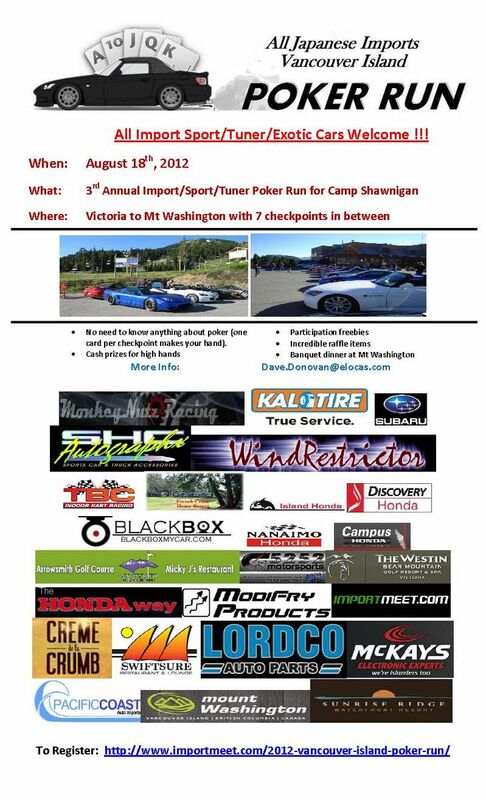 I only advertise this event on car forums so please help me get the word out. Q-FM will be doing a bit of advertising for the event for us and Saunders will be posting it up on their business sign shortly. Thanks again everyone for helping me to make this an ongoing success!!! Last edited by DDonovan; 07-16-2012 at 03:20 PM.